The first thing that comes to mind of a network engineer when attempting to troubleshoot a problem is Ping. This command, native on all Operating Systems— is one of the fastest and easiest ways to test connectivity between hosts or servers and is usually the first utilities used when going through the Network Troubleshooting process. 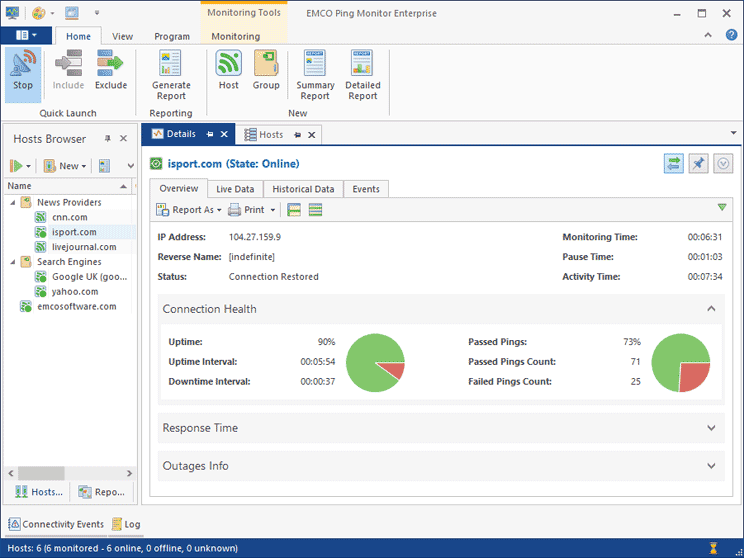 Experienced network admins would even say that a PING is enough to troubleshoot most Network layer problems and is all you might need for simple monitoring (if no additional info is needed – if so, then look at our SNMP Monitoring tools for more in-depth tools). Ping Monitoring is a method that helps you check the availability of a network device – Servers, Desktops, Laptops, Wifi Access Points, L3 Switches and Routers/Firewalls . A monitoring server uses ICMP packets to keep track of another device (or group of devices). It sends a ping and waits for its response. The monitoring server then compares all results and calculates an overall connection health. A simple “extended ping” (ping x.x.x.x -t on Windows), or by default in Linux and MacOS can help you keep a server monitored for a prolonged period of time. The ping will continue without stopping and will show the size of the packet in bytes, destination IP, ICMP sequence number, Time-To-Live “TTL,” and most important the response time. Ping Monitor tools and software improve this simple functionality and add more details. These tools usually add a front-end interface that shows graphical results in real-time. You can also schedule automatic pings, ping multiple IPs at the same time, run auto-discoveries, and even perform actions based on results. In this article, we'll go through the Best Ping Monitor Tools and Software for your enterprise networks. Reasons we chose these tools are due to their reliability, easy of use to implement, documentation and support. They can be used in many different cases outside of a ping monitor as well, so that is always a plus in our book! SolarWinds offers Ping Monitoring functionality through the Engineer’s Toolset, which is a bundle of network software including over 60 tools, such as Automated network discovery, Real-time monitoring and alerting, Configuration & log management, and a lot more. Before starting to ping your network, you can run the auto-discovery. This functionality will help you to find all the connected devices in your network. The auto-discovery will create an inventory so that you can easily access each device and ping it. 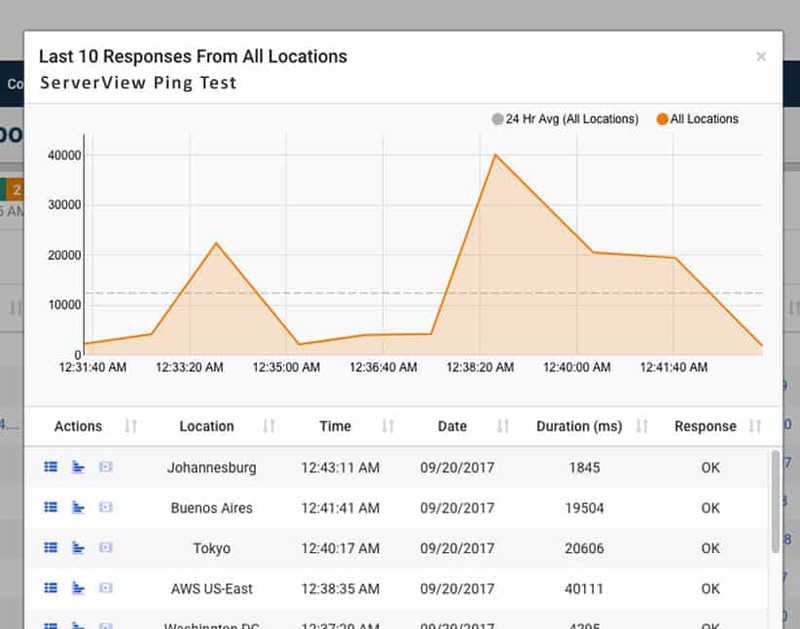 With the Ping Monitoring functionality, you can keep track of the response time and packet loss in real-time of all your network devices. This flow of continuous pings are often referred to as a Ping Sweep. How to Ping monitor with the SolarWinds Engineer’s Toolset? First, select the devices that you want to ping. It can be an individual or a group of devices. The ping monitoring software will show you the results in a list, which you can later export to a text file. It will also display the output in graphical charts which you can also save as an image file. If you use the tool frequently, you can create custom profiles to save time and monitor a specific set of devices with a simple click of a button. The Engineer’s Toolset installs only on Windows systems, but can monitor a variety of other systems. 30 Day Free Trial Download! Get a fully functional 14-day trial of the entire Engineer’s Toolset including the Ping Monitoring Tool. PRTG Network Monitor is a network monitoring tool created by IT infrastructure monitoring software developers, Paessler AG. This tool can keep track of anything that you can imagine within an on-premises infrastructure, cloud environment, or hybrid scenarios. PRTG Network Monitor uses Ping Monitoring as the basis for checking the availability of all the devices. The tool comes with an advanced ping functionality, which lets you ping a single or group of devices. This tool uses the concept of sensors to keep the network monitored. With these sensors, you can watch different metrics and specifications on every device. The ping monitoring sensors, include the typical Ping Sensor, Ping Jitter, WMI Remote Ping, SIP Options Pin, Cloud Ping Sensor, and a lot more. The packet size in bytes. Ping Method. 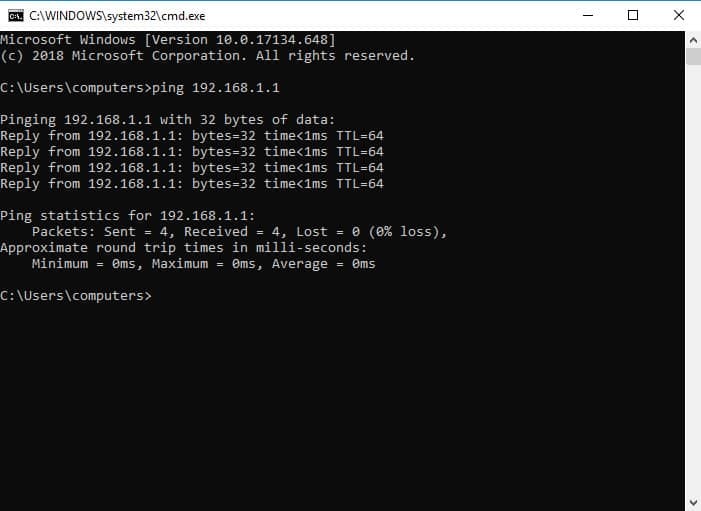 One ping vs. multiple pings. These monitoring sensors give you a great deal of information at your fingertips. The Ping sensor provides necessary information such as downtime, max/min ping time, and packet loss. PRTG also has a FREE Amount of Sensors that come with the Free Edition, so getting started is simple! The price for the license of PRTG is based on the number of sensors. For example, the PRTG500 (500 sensors for $1365.00), PRTG2500 (2500 sensors for $5100), and finally the PRTG XL1 (Unlimited sensors for $11,500). An unlimited free version of PRTG Network Monitor for 30 days. 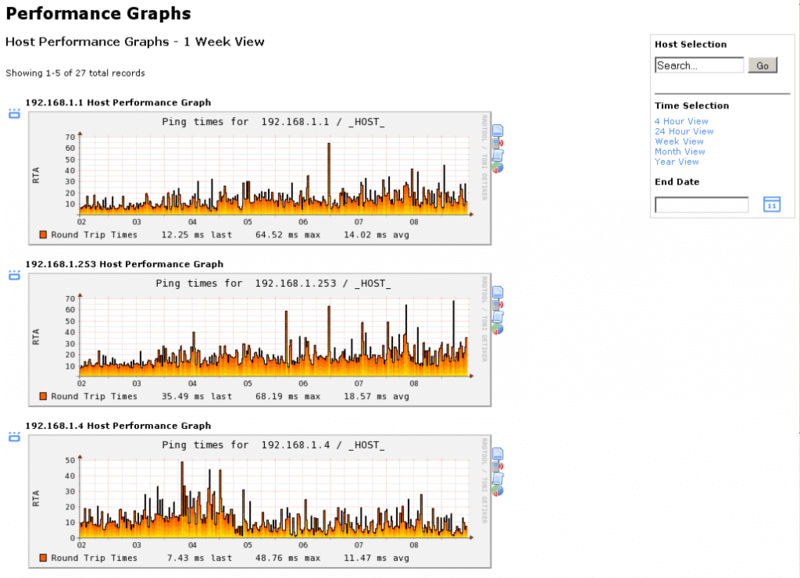 OpManager by ManageEngine is one of the most powerful network monitoring tools. It can monitor infrastructure, VMs, and applications, and keep track of their performance and faults. OpManager works on medium to large size networks and supports multi-vendor IT environments. OpManager can even keep track of devices in non-ICMP environments, such as DMZs or EDGE switches, using Telnet or SNMP polling. ManageEngine also offers a 100% free Ping tool! With the Free Ping and Traceroute tool, you can monitor the availability of all your network devices, servers, and hosts. The software will show you the Packet Loss percentage, Round-Trip-Time “RTT,” and the number of hops. The tool also comes with a great notification system. 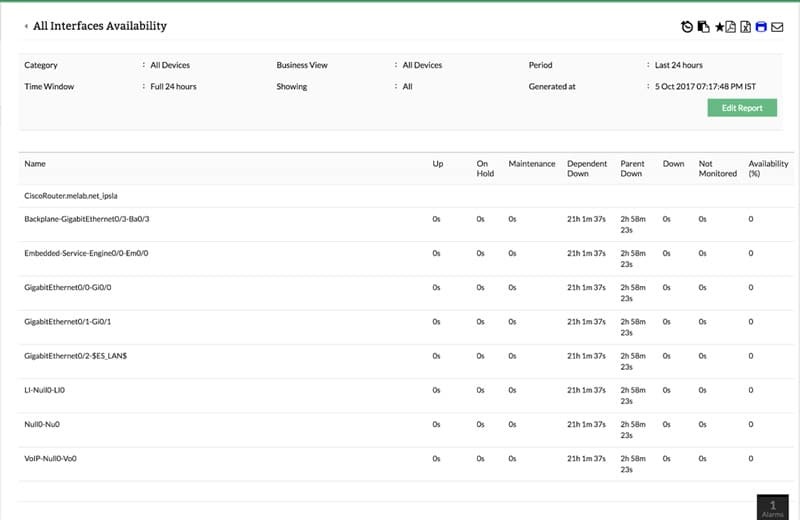 The dashboard will display alerts and send you notifications when a device is unavailable. The free tool is simple and might not be appropriate for the enterprise level. You can only monitor up to 10 servers or websites at the same time. The price for OpManager is not on the official site, but you can request a price quote. Get an unlimited free Opmanager trial for 30 days. You can also download the Free ICMP ping and Traceroute tool and monitor up to 10 devices. Nagios develops Nagios Core and Nagios XI, which are network monitoring and management software. The first one, Nagios Core is a free and open source software; it can monitor your entire infrastructure, networks, and servers. It also includes a powerful alerting system. The other tool, Nagios XI is the advanced and enterprise version of the Nagios Core. It is super easy to use and comes with many features. Nagios Core and XI, come with complete ping monitoring capabilities, which include packet loss and reachability. Both tools can help you monitor and improve the availability of your network. Thanks to the popular Nagios community, you can improve the product with third-party plugins. For example, you can use the check_ping command plugin to keep track of the ping results of a remote server. You can also configure it to send notifications based on certain threshold levels. Nagios XI is supported by CentOS or RHEL (Red Hat Enterprise Linux) versions 5, 6, or 7. Nagios Core is a free and open source software. The cost for Nagios XI starts at $1,995 (USD). Get a 60 day free trial of Nagios XI or download open source Nagios Core for free. Spiceworks is a professional online network platform for IT experts. They have developed a free network inventory, monitoring, and report generation software. Spiceworks is also an online community of IT experts that provide free advice and support. 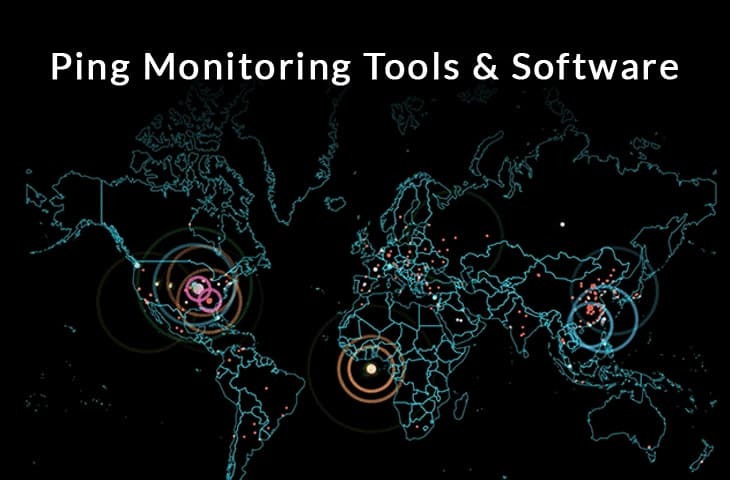 Spiceworks Network Monitor comes with a free ping monitoring tool aimed for small-to-medium businesses. This tool is suitable for networks of about 1000 devices or below. Aside from its powerful ping capabilities, you can also check connectivity through HTTPs, custom port, SSH, and SIP. To monitor ping with Spiceworks, start by adding the IP address, subnet, or hostname. The tool will find hosts/servers and automatically add them to the dashboard with a default timeout. To keep the network monitored, Spiceworks will continue to ping these IPs. If a host is not answering after the timeout expires, the tool will send an alert. If you are in a non-ICMP environment, you can also find metrics such as CPU, Disk, Network utilization, Memory, etc. The dashboard shows color-coded buttons and graphics to help you quickly determine whether a device is up or down. Spiceworks Network Monitor is compatible with Ubuntu, Debian, Windows, and MacOS. Spiceworks is a free software fully supported by advertisement. Although it comes with four different plans, Individual, Team, Enterprise, and Custom, all of them are 100% free. Spiceworks Network Monitor tool from free. EMCO Ping Monitor is a network-connection-state monitoring tool. It can be configured to automatically check the connection of network devices and hosts through continuous pings and to send alerts when it detects a failure. The tool can also give you a lot of additional information, such as uptime, outages, failed pings, and more. You can also expand the functionality of the tool, by creating custom scripts that launch particular applications or run commands when a connection is down or restored. Using the Status Overview, you can get a summary of all the monitored hosts. You can see their ping response rates, connection health, and outages. You can also print and export this information as reports. See real-time statistics shown as charts. Show Ping statistics for any specific period for a selected host. Compare the performance of hosts for any period. Send emails, activate notifications, or play sounds when a failure occurs. Make the tool respond to certain events by executing scripts or files. Generate reports automatically and send them via email. Create rich reports in PDF, HTML, or email. EMCO Ping Monitor is only available for Windows OS. You can run it as a Windows program or Windows service. EMCO Ping Monitor comes with three editions with different pricing. The Free Edition (Monitoring of up to 5 hosts), the Professional Edition ($99 for a single copy), and Enterprise Edition ($199 for a single copy). Get the Freeware to test the product for up to 5 hosts for an unlimited time. You can also download a free 30-days trial of the Professional, or Enterprise Editions. 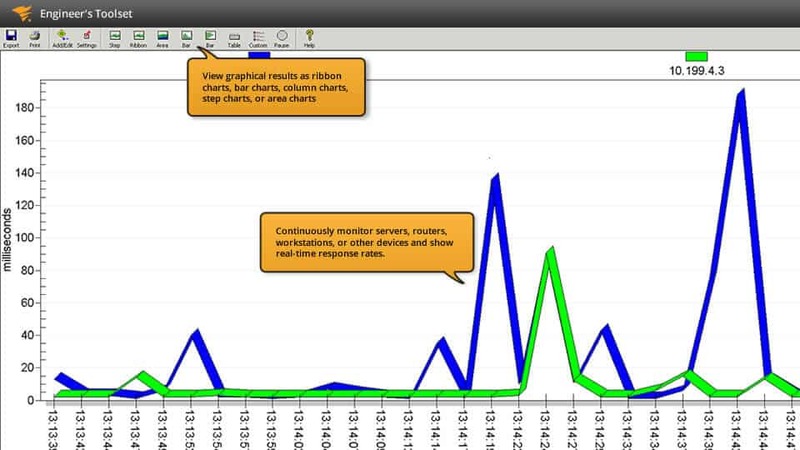 PingInfoView is a simple ping monitoring tool developed by NirSoft. This lightweight program helps you ping multiple IPs or hostnames and get all results summarized in one page. 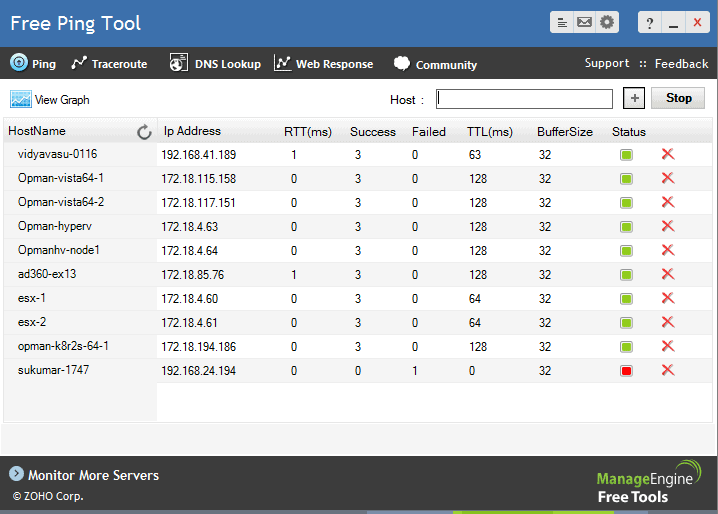 The table view will show you the output details such as TTL, average ping time, last succeeded, last failed, and more. You can also save and export the ping results in a text, HTML, or XML file. The tool displays the results in real-time and can classify the connection status through color codes. You can also use PingInfoView to keep track of your devices in a subnet, by setting up automatic and scheduled ping scans. PingInfoView is a handy ping tool for small-to-medium businesses, and 100% free. Rather than using the ping command through the CLI, this tool gives you the results through its graphical interface. PingInfoView is only available for Windows. Get PingInfoView from its official website. ICMP Ping Tool Monitor belongs to the web-based Server Monitoring software bundle from Dotcom-Monitor. This tool helps you check the connectivity of network devices, servers, and hosts. It uses ICMP ping requests to keep track of the uptime status of the devices so that you can find and solve networking problems faster. The tool also comes with traceroute capabilities, to help you troubleshoot on a hop-by-hop connection. It is also capable of producing reports with rich graphics and details about the ping and traceroute results. The output includes the duration of the ping (in ms) and response (OK or Failed). ICMP Ping Tool Monitor is also capable of sending alerts when it detects a certain threshold that falls below a limit. It sends ICMP ping requests. It can find network outages. Test for UDP server availability. The price for the Web Services which includes the ICMP Ping Tool Monitor and many more capabilities, starts at $19.99/month. Get an unlimited 30-day free trial of Dotcom-Monitor ICMP Ping Tool. PA “Power Admin” Server Monitor is an agentless server monitoring software. It is straightforward to install and use. With it, you can ping multiple IP addresses and hostnames at the same time. 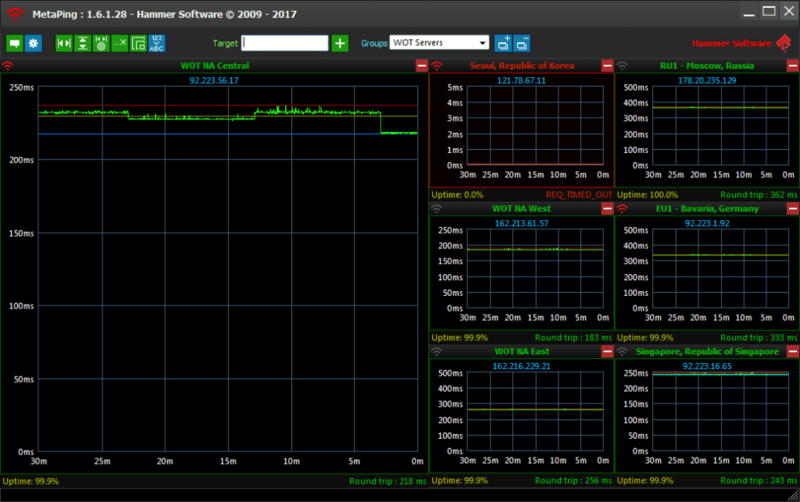 You can also monitor other parameters such as CPU, Memory, Windows Event Logs, SNMP, Syslog, Disk usage, and a lot more. PA ping monitoring solution is capable of sending ICMP ping messages to multiple hosts automatically. 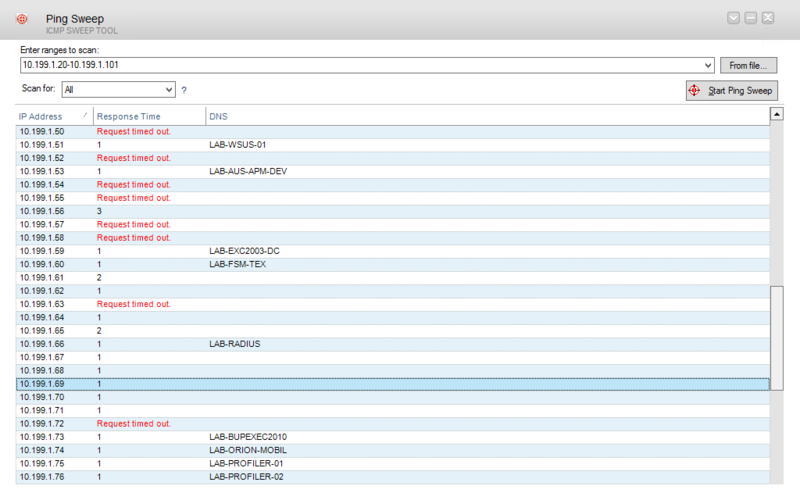 You can schedule frequent pings and configure the tool to respond with actions if the timeout value is exceeded. 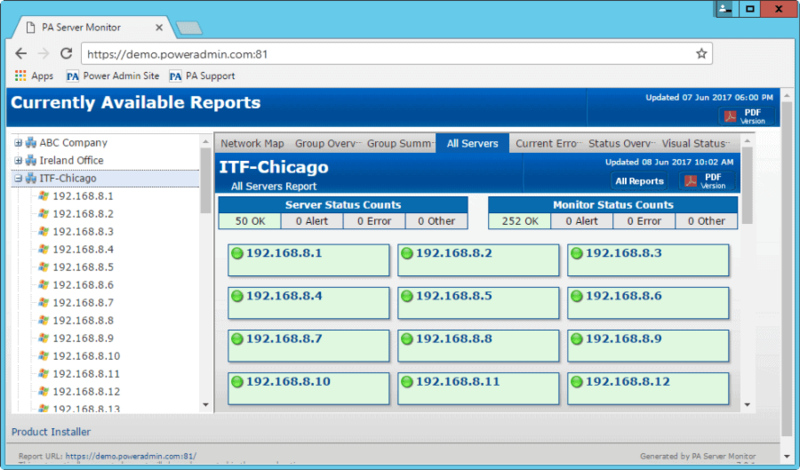 PowerAdmin also comes with an advanced alerting system. You can configure it to send alerts if a certain number of ping responses fail. You can also set alarms based on the maximum response time for a successful ping, and monitor a device for dropped packets. Power Admin is only available on Windows Systems. Test the product before buying it. Download a 30-day free trial of the Power Admin. MetaPing is a free visual ping monitoring tool developed by Hammer Software. It is lightweight, and easy to install and use. The software is based on graphics and charts, so it is an excellent option for monitoring the availability of networks in NOCs. The tool is great for small-to-medium businesses but might find it challenging on larger ones. The dashboard shows a great deal of information, such as a quick summary of the availability of each device, and the latency that they are experiencing in real-time. Once you run ping with MetaPing, the results will show you what devices are connected, their network latency, and its historical charts. When you test multiple hosts, the results show the uptime percentage, maximum, minimum, and average latencies for each host. MetaPing is only compatible with Windows systems. 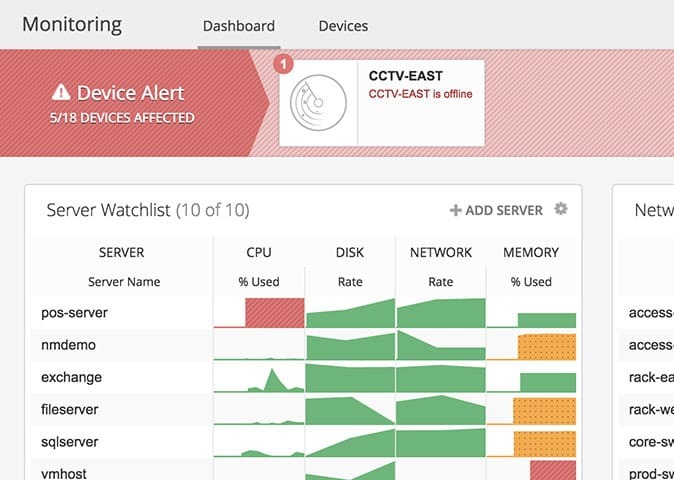 Ping Monitoring tools and software make it easier for network admins to keep track of the availability and performance for each device on the network. All the products on this list are fantastic ping monitoring tools and software that you should download and try in your network before making a final decision on which one you ultimately go with. Although some free tools are quite simple and can be too light for large-scale networks, they are a good starting point for keeping critical subnets monitored. But only a few ones stand out and work for large-scale enterprise networks. Tools such as SolarWinds Engineers Toolset, PRTG Network Monitor, OpManager, and Nagios XI are suitable for enterprise environments and have extraordinary ping capabilities. These tools also come with visual GUI, notification and alerting system, reporting, and additional features such as inventorying auto-discovery, and a lot more. All of these tools offer a free trial which is the best way to start testing software. 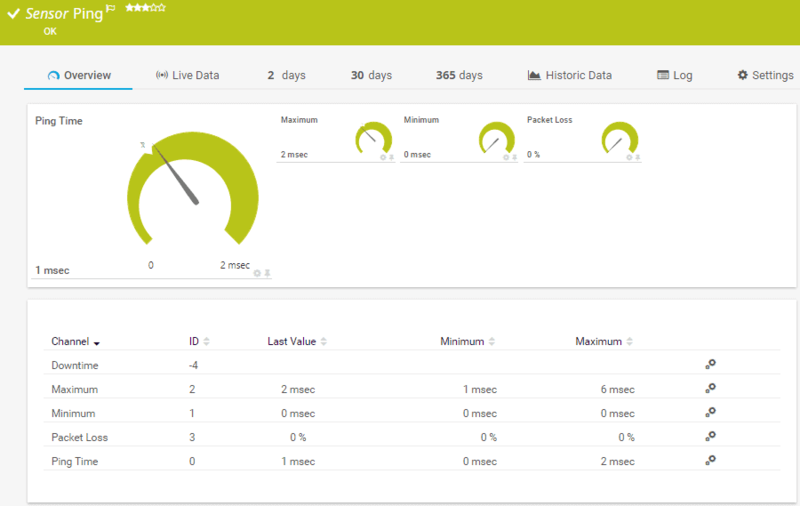 Download a free trial and start monitoring your network today!